OWIT-Toronto - For the Love of Wine…a Holiday Event with International Flavour! For the Love of Wine…a Holiday Event with International Flavour! 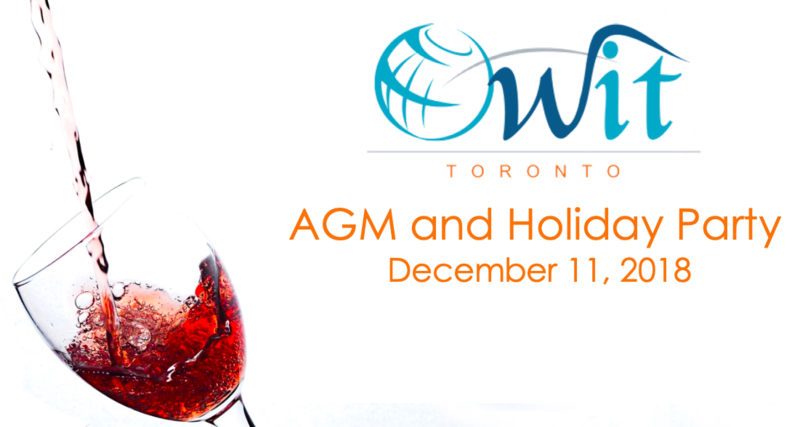 OWIT-Toronto (Organization of Women in International Trade) will mark the end of 2018 with a festive networking and holiday event featuring a presentation on wines of the world, following our Annual General Meeting. Join your colleagues in trade for quality networking….and a bit of wine tasting and education. Wine expert Christian Frayssignes will share his passion for wine with you….along with tips on wine selection, tasting, and storage. Born and raised in Paris, France, Christian has been surrounded by the allure of wine all his life. After many years of advising pharma and biotech companies, he decided to live his 30+ years of passion for wine through a luxury wine consulting practice. That includes designing unique wine cellars to ordering specialty wines from the smallest corners of the world. He is also currently building for the Dymon Group, a new wine storage and wine club facility to open in the spring of 2019 in Etobicoke. Christian is President and Cellar Master of the International Wine and Food Society (Oakville chapter). He is also Honorary President of the European Union Chamber of Commerce in Canada and VP of the Belgian Canadian Business Chamber and sits on the Board of the European Union Film Festival in Toronto.